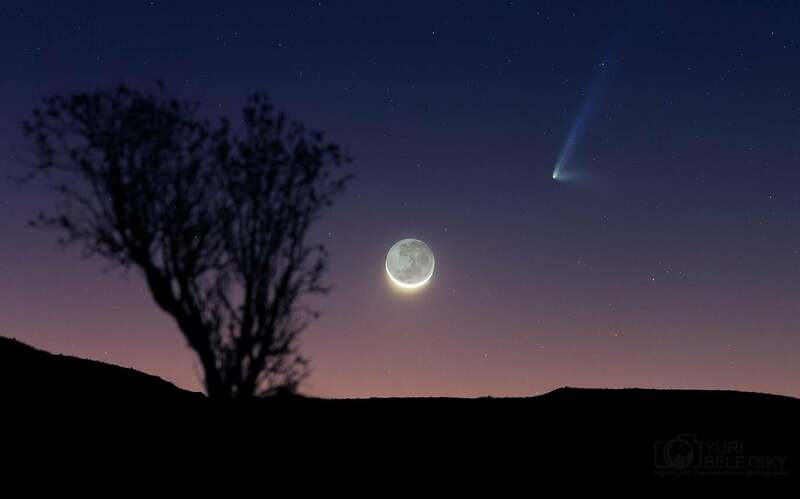 Comet Pan-STARRS: Yuri Beletsky photo of a bright comet. I somehow didn’t hear anything about the comet C/2014 Q1 (Pan-STARRS), which isn’t too surprising: It never got bright to Northern Hemisphere observers. The comet’s orbit kept it mostly in the Southern Hemisphere’s skies, and it only recently got brighter once it swept past the Sun in its orbit. The tale of the two tails: Comet Pan-STARRS and the thin crescent Moon. He took this photo from a valley in northern Chile on Friday. He told me he had to climb a hill to get the shot he wanted, since the area is surrounded by mountains. I think he found an ideal spot. The picture is HDR, or High Dynamic Range: It’s a composite of different exposure times, to compensate for twilight, the bright crescent Moon, its much dimmer dark part lit by reflected Earthlight, and of course the comet itself. The comet is sporting two very different tails! Pointing straight up is the ion tail, made of gas that sublimated away from ice in the comet and which was subsequently ionized by the Sun’s ultraviolet light. Ionized gas is missing one or more electrons, giving the atoms or molecules a positive charge. The Sun’s solar wind blowing past the comet carries its own magnetic field, which sweeps up the ions and carries them away. The solar wind is typically blowing at several hundred kilometers per second, far faster than the comet, so the ion tail points directly away from the Sun. In the meantime, as the ice holding the comet together turns to gas, it also loosens dust in the comet. This leaves the solid nucleus, and gets hit by sunlight. This gives the dust particles a little bit of energy, changing their orbits much more gently than the ions. The dust tail curves away from the comet, leaving in very nearly but not quite the same orbit. In general ion tails are green or blue (the glow of carbon or carbon monoxide molecules dominate there) while dust tails are orangey or yellow (reflecting and scattering sunlight). The ion tail of Pan-STARRS appears to have a lot of structure in it as well. If you live Down Under and want to see this for yourself, Universe Today has a good article with maps. If you’re north of the equator, you’re out of luck. By the time it’s in our skies again it’ll have faded to invisibility. Oh, and the comet’s unusual name? The designation has to do with when it was discovered and what kind of comet it is, and Pan-STARRS is the name of the observatory where it was discovered: the Panoramic Survey Telescope and Rapid Response System. This observatory surveys the sky looking for moving objects, and has found quite a few comets. Get used to hearing its name; it’ll be finding many such dirty snowballs for many years to come. If you want to learn more about comets, then do I have a video for you: My Crash Course Astronomy episode all about them. Finally, you should also check out Beletsky’s astrophotos on 500px and follow him on Facebook. His stuff is really, really good.